Never quite got the hang of tap, tap, tapping on a touchscreen keypad? If you’re using an Android phone and you’re feeling a little daring, there’s a clever—and surprisingly elegant—alternative: swiping. For a little more than a year now, Android has boasted a clever feature called Gesture Typing, which lets you type on your phone’s virtual keyboard by swiping your fingertip from one letter to another. You can enable Gesture Typing from the Language & Input section of the Settings app. As you slide your finger, Gesture Typing does its best to guess the word you want to type—and luckily, Gesture Typing’s best guess is typically quite good. Of course, typing with touchscreen gestures takes some getting used to, but it doesn’t take long to get the hang of it—and don’t be surprised if you never go back to tapping. Indeed, within a few minutes, I found myself “typing” with ease, with my thumb making big, looping gestures across the virtual keypad on my (now long-in-the-tooth) Galaxy Nexus phone. Got an older Android phone? 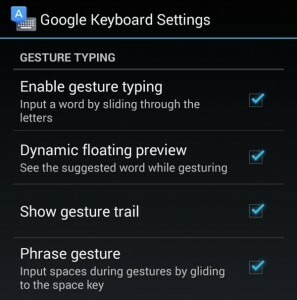 You can still add Gesture Typing to your device by downloading and installing Google Keyboard (which works on Android phones with version 4.0 and up of the Android OS) from the Play Store. Launch the Settings app, tap “Language & input,” then find the “Keyboard & Input Methods” heading. Make sure the Google Keyboard option is checked, then tap its settings button immediately to the right. Scroll down to the Gesture Typing section, then check the box next to “Enable gesture typing.” You can also tick off a few other options if you wish, including a “gesture trail” that appears as you swipe, as well as a “floating” preview of the word that Gesture Typing thinks you have in mind. Now, go ahead and jump to any app that requires the keyboard, and try swiping instead of typing. Neat, right? 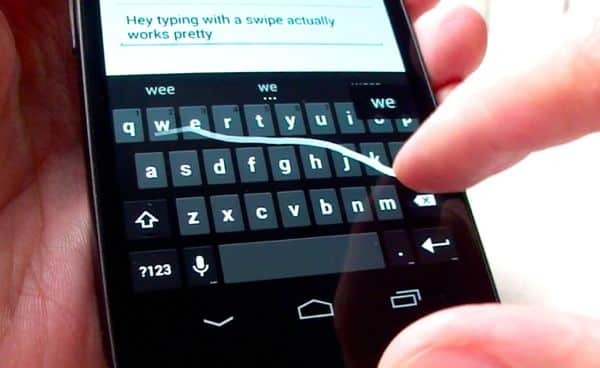 An alternative to Gesture Typing is Swype, a third-party Android app that’s actually been in the swipe-to-type business longer than Google has. Swype comes with a variety of features you won’t find in Google’s Keyboard app, from gesture shortcuts (which let you, say, jump to the number keypad by using a special swipe) to custom keyboard themes. You can even tweak how much of the screen the Swype keyboard fills. The only catch: the Swype app (which is available from the Play Store) will set you back $4, while Google Keyboard is free. Don’t bother to tap the space bar as you’re swiping; both Gesture Typing and Swype will add spaces between your words automatically. Click here for more Android tips! Note: This updated and revised tip was first published in November 2012.